It's certainly hard to argue the appeal with family audiences for 2008's "Journey to the Center of the Earth" but let's be honest, it wasn't exactly a screaming success. It was released during the early stages of the current 3D, the picture was a novelty, capturing box office attention with its commitment to in-your-face spectacle, made more child-like with the antics of star Brendan Fraser. Four years later, Fraser is gone and now most audiences resent 3D releases, making the idea and timing of "Journey 2: The Mysterious Island" questionable at best. Burdened with a dull script littered with cliché, it makes better use of its 3D environments, bringing in Dwayne Johnson and Michael Caine. In possession of a satellite code sent by his estranged grandfather Alexander (Michael Caine), Sean ( Josh Hutcherson) is itching to find the mythical Mysterious Island and retrieve his adventurous elder. Hoping to bond with his new stepson, Hank (Dwayne Johnson) agrees to accompany Sean to Palau to see if the clues actually do lead to a land previously thought to exist only in the imagination of author Jules Verne. Teaming up with bumbling helicopter pilot Gabato (Luis Guzman) and his helpful daughter Kailani (Vanessa Hudgens), the foursome take off into the great unknown, finding a typhoon ocean portal that brings the gang to a place of wonder and environmental instability. Meeting up with Alexander, the team learns they only have a few days before the island is plunged underwater, an escape challenge that requires knowledge of Verne's bibliography and the ability to dodge monstrous lizards, birds, and electric eels to complete. The only real connecting element for these two features is the character of Sean, a punky kid explorer in the original and now a mature sidekick with a crush on Kailani in the sequel. It's something of a weak link connecting the movies. The real relationship that is mined here is the tentative one between Sean and Hank, forcing up their discomfort as stepfather and stepson, while Alexander is the distant grandfather, missing the family experience as he parades all over the world (and beyond). Kailani and Gabato also have a tired subplot, finding the pilot worried about his daughter's disappearing dreams of college due to financial hardship. The conflicts are played down to an audience capable of accepting less contrived dramatics. It's artificial material that doesn't kill the picture, only hurts it on occasion, grounding the fun of it all with incredibly uninspired writing. Hitting the shelves on Blu-ray recently, anyone with a taste for adventure now has the chance to take it home for yourself. The picture quality is outstanding on Blu-ray bringing to sharp contrast all the pitfalls and high flying stunts that make this film a joy for children. The package comes with 2 discs, the first which contains the Blu-ray version of the film also boasts the special features which are: an interactive map, gag reel and deleted scenes. On disc 2, all we have is the standard version of the movie. Journey 2 isn't lightning paced, but when it makes the effort to revel in its Verne-themed playground of creatures and fantasy investigation, it's amusing. The sequel could've been bolder, with more emphasis on peril rather than interpersonal distance, but in the end it makes enough of an impact to resonate with audiences. 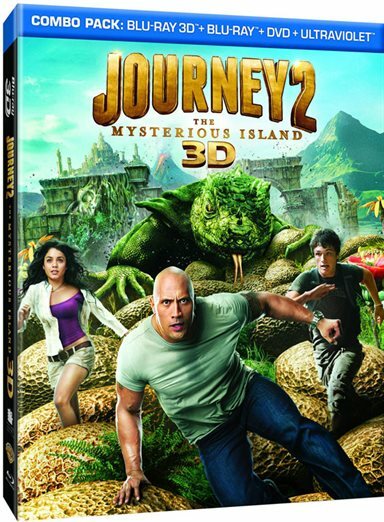 Journey 2: The Mysterious Island available on Blu-ray Combo pack, DVD and for download 6/5! Download Journey 2: The Mysterious Island from the iTunes Store in Digial HD. For more information about Journey 2: The Mysterious Island visit the FlickDirect Movie Database.